Wednesday, May 20 -1931 It was late when [Ilo?] got away. I went to Dr Prentiss funeral at Trinity Church in forenoon. at 2.30 oclock The Andersons came to take me to Mrs Walkers funeral. Ott at both there funerals. The Whetstones and Birdie on an Auto trip. I got letters ready for LeGrand. Ida Martie Patten & Laura. to mail when Ott came to take me to The Jefferson to The Kiwanis dinner and programe. It was nearly ten when I got home Enjoyed it Weather very cool. 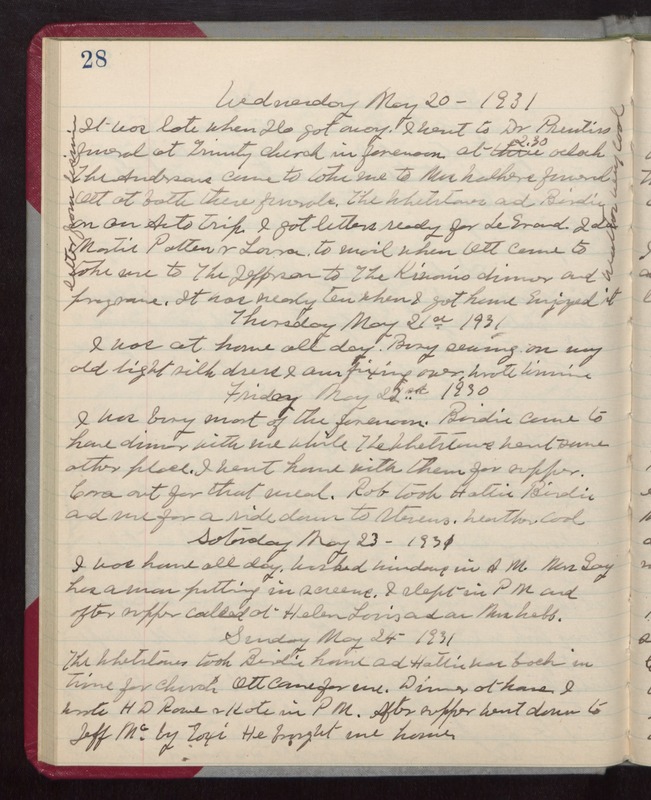 Thursday May 21st 1931 I was at home all day. Busy sewing on my old light silk dress I am fixing over. Wrote Winnie Friday May 22nd 1930 I was busy most of the forenoon. Birdie came to have dinner with me while The Whetstones went some other place. I went home with them for supper. Cora out for that meal. Rob took Hattie Birdie and me for a ride down to Stevens. Weather cool Saturday May 23- 1931 I was home all day. Washed windows in AM. Mrs Gay has a man putting in screens. I slept in PM and after supper called at Helen Louis and at Mrs Webb. Sunday May 24- 1931 The Whetstones took Birdie home and Hattie was back in time for Church. Ott came for me. Dinner at home. I wrote HD Rowe & Kate in PM. After supper went down to Jeff Mc by taxi He brought me home.